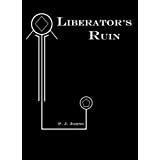 Liberator’s Ruin turned out to be quite an enjoyable read. A lot of characters are introduced early on and as we are getting to know each group of people it would appear they have nothing to do with one another. Each comes from a different part of the land, each has a different agenda in mind. I’ll give a brief introduction to some of the main characters. Princess Anna is the last of her royal line, an Illysian determined to lead her people against the Rhivillans who have taken over their land and killed off everyone in her family. Pallen is a lifelong friend of the princess, an Illysian who is set up as a mole of sorts in Rhivillans territory. His job is to train an Illysian fighter named Claye, who hopes to go up against the Rhivillan champion one day. But Pallen has grown old during his time away from Princess Anna and all he wants out of life is to be left in peace to train Claye. Will he be able to pull himself together when she finally approaches him for help? Francesca is saved from mercenaries who destroyed her town and the people who made their homes there. She and several other women are taken prisoner, their fate to end up raped and then sold as slaves. Nathaniel An’Rieyr is Captain of the airship Storm Brother. He is a commodities trader who wants to keep nose out of politics, but who also happens to enjoy the spice of a little danger added into the picture once in a while. He rescues Fran and the other women from their miserable fate and ends up hiring Fran on as a mechanic for the Storm Brother. The crew of the ship are all interesting characters, very well drawn out personalities and a real pleasure to read about. I especially liked Chusa and Grekhis. Chusa is an unassuming dark-skinned man who acts as body guard for Captain An’Rieyr. If anyone gives Nathaniel trouble, they won’t see Chusa coming until it’s too late. What I liked was the comradery between Chusa and Nathaniel, more equals than boss and employee. Grekhis is not quiet human. A Markynd, he is short, but powerfully built with a snout-like nose and two tusks curving up from his mouth. He is the head mechanic Fran works under on the ship. Also working for the Rhivillans government is a man known as the High Inquisitor. He uses powerful magic to assist him in his duties and will go to any lengths to bring Princess Anna and her people down, squash anyone who gets in his way. As we follow along with each of these groups we start to see how they will all be drawn together toward the end. Besides the great characters involved, what I found that made this such a great read was not realizing until it was too late who the traitors would be. I turned out to be as shocked as some of the other players involved. Princess Anna turned out to be a difficult person to judge. She appears to be one of the good guys when we first meet her, but as we watch everything unfold it would seem she is just as ruthless as the High Inquisitor when it comes to getting her way. I found by the end that I didn’t like her much. But there were many twists and turns that kept me guessing right up until the last page. On the down side, I have to say that at times I felt too much description was given out that probably wasn’t necessary. It tended to slow the novel down a great deal and I found myself wanting to skim through parts in order to get back into the action. Also there were quite a few typos, especially in the last half of the novel, and punctuation problems, especially where dialogue is concerned. I’m fairly picky when it comes to these types of details, so you may find it doesn’t bother you at all. Without the problems I just mentioned I would’ve easily given Liberator’s Ruin five stars. A good read and definitely one I encourage you to take a look at. I’ll look forward to reading more by P.J. Johns in the future. Posted by Denna Holm on August 21, 2011 in Archives.